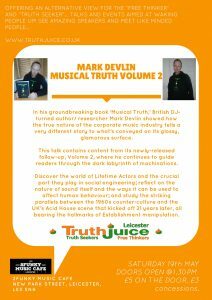 In his groundbreaking book ‘Musical Truth,’ British DJ-turned author/ researcher Mark Devlin showed how the true nature of the corporate music industry tells a very different story to what’s conveyed on its glossy, glamorous surface. This talk contains content from its newly-released follow-up, Volume 2, where he continues to guide readers through the dark labyrinth of machinations. 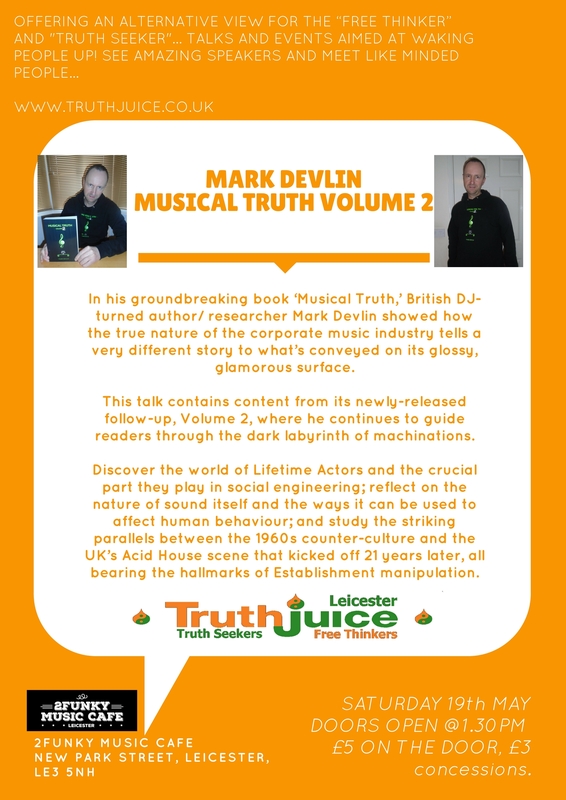 Discover the world of Lifetime Actors and the crucial part they play in social engineering; reflect on the nature of sound itself and the ways it can be used to affect human behaviour; and study the striking parallels between the 1960s counter-culture and the UK’s Acid House scene that kicked off 21 years later, all bearing the hallmarks of Establishment manipulation. Doors Open at 1.30pm Talk starts at 2pm. All proceeds go towards putting on future events.